The following tribute to Katherine Paterson was delivered by Dale Brown at the Conference on Christianity and Literature luncheon in Chicago on January 10, 2014. During the recent Christmas season, I was again surprised by the much told story of Mary and Joseph, especially that part of the narrative when they each encounter an angel. Told of remarkable events, supernatural events, at work in their very lives, they find the strength to accept the incredible, the mystery of it all. But we are mostly left to imagine the subsequent influence of these wild, angelic visitations. There is that great line following the birth and visits from wise men and shepherds and strange sounds in the night sky—“Mary treasured up all these things and pondered them in her heart.” I should think so. The Bible is, of course, full of stories about folks who “store up” things in their hearts after having encounters that can only be called astounding—remember Moses and Hannah and Elijah and David and Saul and that soldier at the cross. These are the sort of experiences that leave a mark, things “not so much seen as felt,” as Annie Dillard puts it in Tinker Creek. Artists and writers, poets and prophets are often those people among us who have the courage to recognize the extraordinary and the gift of telling us about it. Such people enlarge us by offering, in the words of Dana Gioia, an articulation, “giving our inchoate experience shape and consciousness so that we might better understand and remember it." Today we are very pleased to honor one such artist. The 2014 Conference on Christianity and Literature Lifetime Achievement Award goes to Katherine Paterson. Writing primarily for children, Katherine has somehow managed to clarify human experience for all of us. She says that “… those of us who write for children are called, not to do something to a child, but to be someone for a child.” It turns out that she has been someone for all of us. 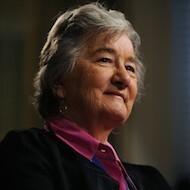 It is no surprise that Katherine Paterson was named a Living Legend by the Library of Congress in 2000 or that in 2010 the Library appointed her National Ambassador for Young People's Literature. She has twice been awarded the prestigious Newberry Medal, once for Bridge to Terabithia and a second time for Jacob Have I Loved. In addition, she has twice won the National Book Award for The Great Gilly Hopkins and The Master Puppeteer. The author of more than 35 books, she has won 19 additional literary awards, including the Hans Christian Andersen Medal, the Astrid Lindgren Memorial Award and a Governor's Award for Excellence in the Arts. As importantly, Paterson has also contributed to the quality of children's literature by being a marvelous teacher of writing, and many of us have been blessed by her speeches at various conferences and gatherings of those interested in the matter of faith and writing. But that is simply information. There is always more to it than that. It would be easy to emphasize these many major literary awards, her role as the national ambassador for children's literature, her advocacy of literacy programs, her lifetime of achievement as a writer, and so much more. But. I have always been most taken by her graciousness, her sense of the big questions with which we all grapple, her life as much as her life’s work. Though she writes powerfully of what O’Connor calls “the dust,” she does more than write with insight into all that it means to be human. She also lives well, a vibrant exemplar of faith embodied. She has said that she wants to "be the word of hope, of faith, of love. To be the word made flesh." In fact, she has declared on more than one occasion, that her purpose is "to share the grace she has been given." That is, she has taken seriously the business of living well as primary to the business of writing well. She has indeed been "the word made flesh" for her family, friends, and colleagues. She has championed young writers, offered herself indefatigably to speak at events all over the world without regard for fortune or fame. The fame has come but has never seemed to overly impress her. She often speaks of "entrusting meaning to the young,” which she has masterfully accomplished by "speak[ing] a word of hope in a world that is harsh and fearful." She understands that children know of the fearfulness—and some adults remember it too. She wants to tell her stories "truthfully and beautifully," which seems to me to be about the best any of us can do. My favorite Katherine Paterson line came in a 2011 speech at her alma mater, King College: "The consolation of the imagination is not imaginary consolation," she said. That connection between the life well lived and the career as storyteller is the territory in which she has worked with grace, beauty, and a commitment to verity. She is a storyteller in a class by herself. Although she often turns her honors into thanks to others: her editor, her family, librarians, teachers, this one, Katherine is about you—your good work, your good life, the goodness personified in your life of achievement. So we are delighted to add this much deserved accolade to your list and we extend it with our gratitude and good wishes. Katherine, you have our esteem, and we offer you this award with our indebtedness for the hope with which you have blessed us.